The book and DVD from the Arizona centennial exhibition “100 Years, 100 Quilts” are on sale now through http://www.arizonahistoricalsociety.org/quilt_bookdvd.asp. The exhibit opens February 18, 2012 at the Arizona History Museum, 949 E. 2nd Street, Tucson, Arizona. The show features 100 quilts created by Arizona quilters showing their concept of the state. It is a show that will destroy your concept of the art of quilting. 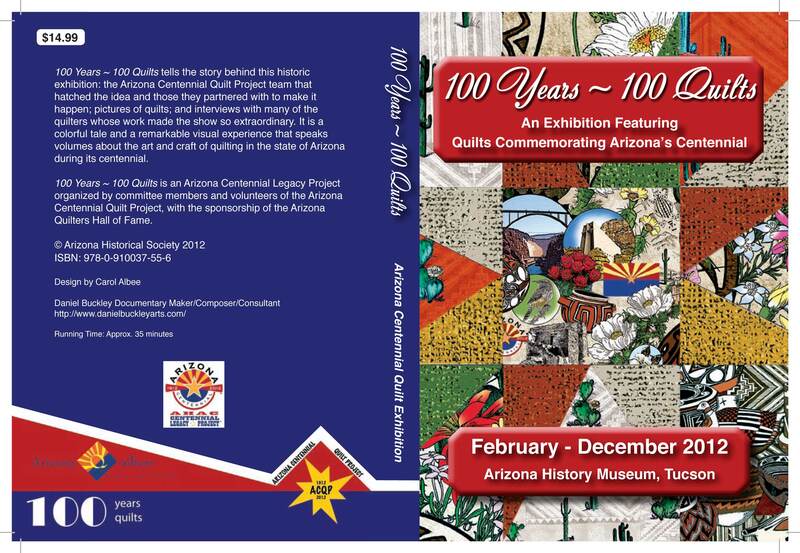 The book showcases images of all 100 quilts photographed by Daniel Buckley, along with the legacy statements each of the quilters shared to explain their take on Arizona. The DVD is a documentary on the “100 Years, 100 Quilts” exhibit shot and edited by Daniel Buckley. It captures the development of the exhibit from the time quilts were first being brought in by their creators to the point where they were starting to be hung for the exhibit. Among those interviewed are the folks who generated the concept and made it a reality, administrators from the Arizona Historical Society which will house the huge exhibit, and a sampling of the quilters who made the show happen. ~ by Daniel Buckley on February 10, 2012.